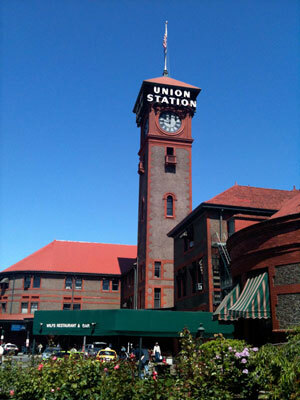 The doors of Portland’s new grand central railroad station, known today as Union Station, were thrown open promptly at 1pm on February 14, 1896. Workmen transferring contents from the nearby old terminal, which was being dismantled, were impeded in their work by crowds of gawkers excited to explore the new station. Nevertheless the afternoon Salem train left on time at 4pm. Railroad man Henry Villard had spearheaded efforts to create a grandiose train depot in Portland – the original plans would have made it the largest depot in the world (which would have just been silly, but well in line with the hubris of some of the Portlanders of the era). Due to financial issues we ended up with the much more modest, but grand nonetheless, Union Station we see today. * Source: Morning Oregonian 15-February-1896.